We’ve all seen pandemic movies before. Andromeda Strain, The Stand, Outbreak, and 12 Monkeys come to mind, but all of these add something extra to the disease: aliens, demons, time travel, or a government ready to nuke a California town. Contagion adds something too, but unfortunately, it is all too plausible – visions of cracks in the thin veneer of order that covers our 21st century civilization. First, let’s establish that such a disease is plausible. Dr. Fatimah Dawood, an epidemiologist with the CDC confirms that animal viruses could combine to produce a deadly virus against which humans have no prior immunity. 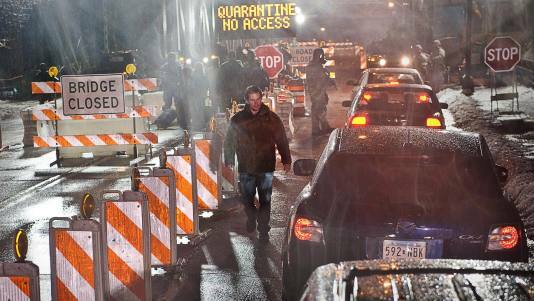 Contagion is a vision of what people most feared during the H1N1 outbreak two years ago. Can you imagine looting and outbreaks of violence if there was not enough food to go around? What about people willing to profit from the distress or death of large numbers of their fellow human beings? Can you imagine local governments delaying the closure of shopping malls at the start of an epidemic because of the Thanksgiving shopping weekend? If not, please send me the location of a portal to the universe where you live. Director, Steven Soderbergh, set out to make a scary and realistic disaster movie set in our post 9/11 and post Katrina world. He builds and maintains suspense with restraint and subtlety. Contagion opens with a dark screen and the sound of a woman coughing. Then we see Gwyneth Paltrow reach into a bowl of nuts at a crowded airport bar. Twenty seconds into the movie and I was gripping my seat. The tension remained compelling throughout this two hour film. As with many books and movies of the action/adventure genre, I didn’t deeply connect with the characters. There were two many stories going on at once, and perhaps I instinctively held something back, not knowing who would live and who would die. Most critics have given Contagion three stars out of four and I would agree. Because of my emotional distance from the protagonists, I wouldn’t call it a great movie, but it is very very good. We learn at the end of the film exactly how the virus mutation occurred. Strangely enough, I thought of the novels of Thomas Hardy, where seemingly minor coincidence leads to disaster. Hardy’s vision of the unfathomable relations between events actually mirrors certain concepts of modern science. I remember hearing a pithy quote about the beating of a butterfly’s wings affecting weather on the other side of the globe. One early 20th century physicist – I do not remember his name – said, “Bend down to pluck a flower and you affect the most distant star.” What do the world views of Thomas Hardy, modern science, eastern religion, and Contagion, have in common? A sense that events are connected and impact each other in ways beyond what the rational mind can ever grasp. What is conspicuous by its absence, in the movie as in our culture, is a parallel understanding of ways that our fellow humans are interconnected for good or ill. Some of the medical workers demonstrate selflessness and compassion, just like certain religious orders during the plague years in Europe, who ministered to the sick until they fell ill. One thing the CDC people have in the movie which no one else does, is information. We know from Katrina that orders, and curfews, and martial law, combined missing information, can drive people to the breaking point. We identify with Mitch Emhoff (Matt Damon) and his daughter and hope we could do as well as they struggle to stay alive and keep their humanity while the social order crumbles. Lawlessness is muted in Contagion, but it is there, and I found myself wondering what I would do, after standing in line for hours at a military food distribution point, only to have the rations run out and a soldier say, “You’ll have to come back tomorrow.” What would I do? Walk away like Emhoff or charge the empty truck like some of the others in a futile display of fear and frustration? Contagion is a movie I will be thinking about for some time. As an extra dividend, my hand washing habits instantly improved. I’m sure yours will too if you see this movie. This entry was posted in Culture, Movies and tagged Culture, movies, Novels, Science. Bookmark the permalink. Thanks! I had been considering going to see this movie. I guess I’ll give it a shot, but I’m glad my expectations aren’t through the roof. The last time that I checked reviews, they were all glowing and I had thought perhaps I’d be disappointed. It is good to have a reality check first. But it does sound as though the movie has some strong redeeming points, despite the weak character development/coverage. Anyway, enjoy the movie. It is very well crafted. You mention a couple of my favorite books — The Andromeda Strain and The Stand — in your introduction. I am fascinating with stories like this, and I think what I like about them is the character development — how do people deal with these issues and what can we learn about ourselves from this. Great review. I look forward to seeing the film. Thanks. With your predilection in books, I’m sure you’ll enjoy the movie. The first thing book this movie reminded me upon seeing the previews was Orson Scott Card’s Speaker for the Dead with the Descolada virus on Lusitania. Specifically when they mention that the virus is mutating faster than they can find a cure for it. I don’t know if I’d go to see this in theaters but it seems like an interesting movie that I might have to check out eventually. Thanks for the tip, Adam. Card is an author I have neglected for too long; I need to catch up. Great review as usual, btw I have nominated you for the Versatile Blogger Award, of which you have probably already have! Just wanted you to know. Thanks for the kind comment and award, JT, I appreciate it!